Having Fun at Home: Outdoor Sightwords Activity: Dumptruck! This is my third time to teach a child to read, and I still love it. I love getting to be there when a child has that whole new world of literacy opened up to him. But that's not to say it doesn't get tedious...a lot. And of course, if it is tedious for me...how much more for a squirmbunctious little boy! Here's one of the activities we've done lately to mix things up a little. It was a big hit! I suppose there could be all kinds of ways to do this, but what I did was put a bunch of small boards and rocks labeled with sight words in a pile and walked to another part of the yard. I called my little construction worker over to me. (Don't forget the hard hat!) Told him that I was building a sky-scraper and needed some materials. 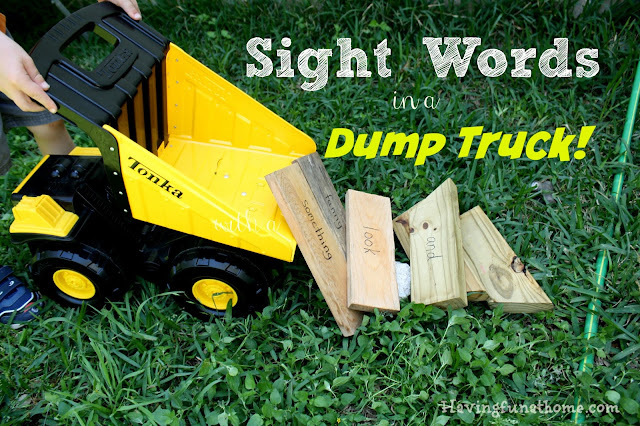 Could you bring me a "look" board in your dump truck, son? After he found the right board, loaded it up and pushed his dump truck over and dumped it in in front of me, I asked him to go back for other words. After a while I asked for two or three at a time (makes dumping them out of the truck more fun). I suppose if your child were even further on in his reading skills you could ask him to bring you a whole sentence. I made a little pile as he brought the words (the skyscraper). At the end, of course, there was no choice but to kick over the skyscraper and start over again! He ended up doing our little pile three times. I left the boards out in the back yard though because I had a feeling he would continue to play with them on his own. Maybe I'm overly optimistic, but I kind of hope that when he does, he will see the words and it will continue to subtly flex his reading muscles. Does it work that way? I don't know. It's a nice thought though, right? I do know that he got his exercise, some practice with his sight words, and a whole lot of happy memories centered around reading. It was a good morning.